1. 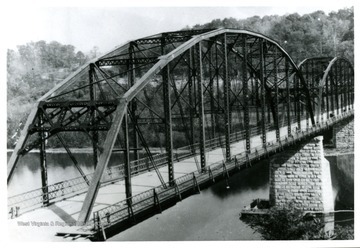 Cheat River Bridge, Monongalia County, W. Va. Cheat River Bridge, Monongalia County, W. Va.
Two men walking on the new bridge over Cheat River at Ice's Ferry near Morgantown, W. Va.
2. 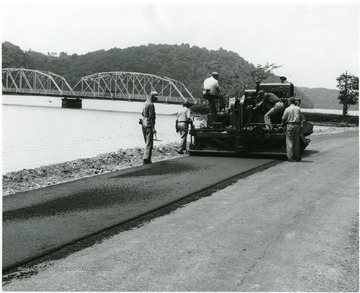 Paving the Road to Mont Chateau, Cheat Lake, Monongalia County, W. Va. Paving the Road to Mont Chateau, Cheat Lake, Monongalia County, W. Va.
3. Steel Bridge Across Cheat River, Cheat Lake, W. Va.
Steel Bridge Across Cheat River, Cheat Lake, W. Va. Located near Morgantown in Monongalia County. 4. 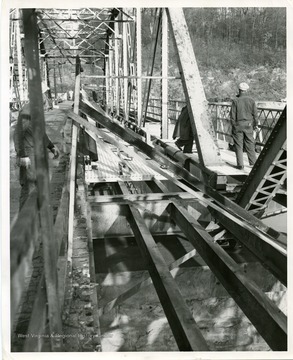 Construction of the Steel Bridge Over the Cheat River, Cheat Lake, Monongalia County, W. Va.
Construction of the Steel Bridge Over the Cheat River, Cheat Lake, Monongalia County, W. Va.
5. 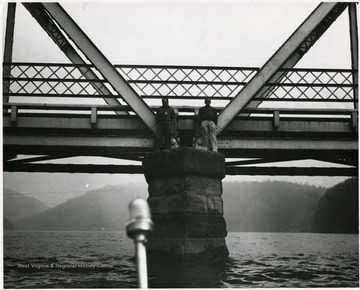 Unidentified Men on Cheat River Bridge, Monongalia County, W. Va. 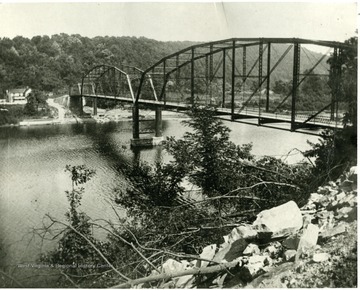 Unidentified Men on Cheat River Bridge, Monongalia County, W. Va.
6. 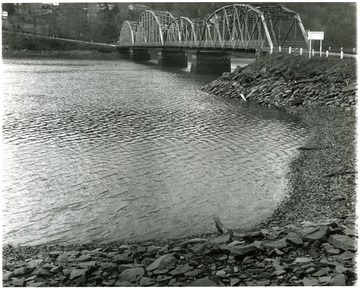 Cheat Lake Bridge From the Northeast Bank, Monongalia County, W. Va. 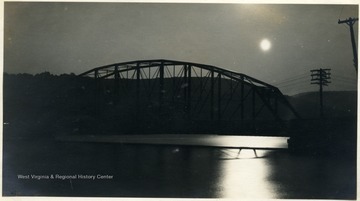 Cheat Lake Bridge From the Northeast Bank, Monongalia County, W. Va.
7. 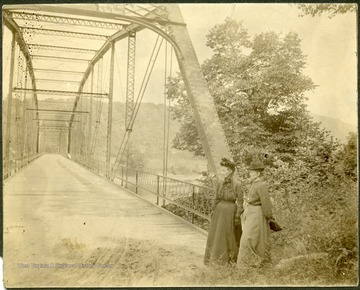 Women Pose Beside Cheat River Bridge, Monongalia County, W. Va.
Women Pose Beside Cheat River Bridge, Monongalia County, W. Va.
Left to Right: Eleanor Ley and her daughter, Lillie C. Ley. 8. 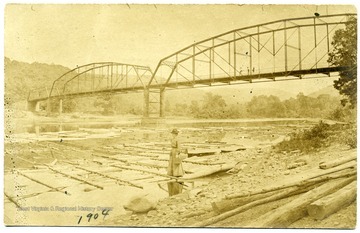 Unidentified Woman Standing on a Wooden Raft in front of the Cheat River Bridge, Monongalia County, W. Va. Unidentified Woman Standing on a Wooden Raft in front of the Cheat River Bridge, Monongalia County, W. Va.
9. 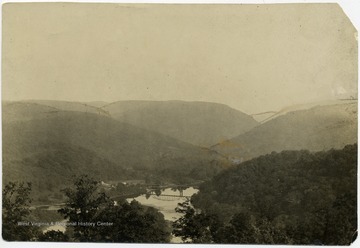 Cheat River Bridge, Monongalia County, W. Va.
A bird's eye view of the bridge in the valley. 10. 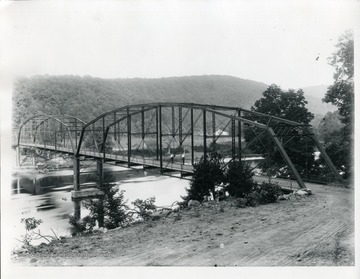 Cheat River Bridge, Monongalia County, W. Va.
'Cheat River Bridge after the other washed away in 1918. This was not built upon the same piers and was a short distance further north. The old one went across from bluff to about where the shelving rock goes out (people swim and fish there now). Toward Mont Chateau. 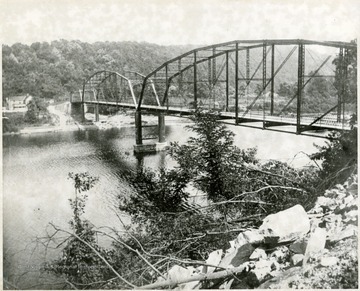 This same bridge was raised and added to when lake went in in 1926." 11. Bridge Over Cheat River, Monongalia County, W. Va.
Bridge Over Cheat River, Monongalia County, W. Va.
Full moon shining over the Cheat River and bridge.